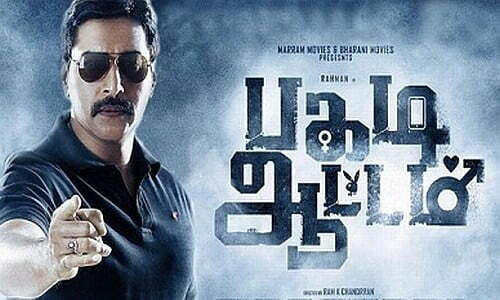 Pagadi Attam is about a top cop investigating the case of a missing youngster who is allegedly involved in romantic deception of girls. Suriya is a spoiled brat who deceives girls in the name of romance. Born in a rich family, blessed with a pleasing look and charming behaviour, winning girls’ love is an effortless thing for him. Hailing from a middle-class family, Kousalya is one among such girls who falls into his trap. Her family, which includes a mother and an elder sister, is shattered after she resorts to the extreme step owing to the betrayal she faces in the relationship with Suriya. One day, Suriya gets kidnapped and finds himself trapped in a wooden box akin to a coffin. A petrified Suriya gets a call from the abductor who refuses to reveal his identity. The kidnapper assures him to let him go if he agrees to the former’s demand. Suriya gets the shock of his life when the unknown kidnapper asks him to discard his genital organ. Quite panicked by the disappearance of their only son, Suriya’s parents lodge a complaint with the police, following which ACP Devendra Kumar (Rahman) takes up the case. He starts questioning his friends and multiple girlfriends and later suspects Kousalya’s sister in the case. What happens in course of investigation forms the rest of the story. Rahman, who comes only in the second half of the film, much to the surprise of the audience, does a neat job in his role, which is a cake-walk for him. The other artistes, comprising mostly of amateurs, are okay. Partly inspired from the Hollywood flick Buried, the story and its execution falls flat. The technical aspects, too, hardly offer anything to cheer about.